Capcom returns to Raccoon City in Resident Evil: The Darkside Chronicles, dropping gamers back into the zombie-killing action in a game that plays like a on-rails shooting title, but promises to deliver a sense of action and suspense. Can those two even go together? What Is It? Capcom's on-rails shooter for the Wii boasts two-player coop and what the developers say are the best graphics ever seen on the Wii. I played through a healthy chunk of the game along side another writer. Due out this winter, the game appeared to be mostly done. Difficulty: When the developer says that the game's going to be easy to play through it's not a good sign. True, Kentaro Noguchi said that if you want to take down all of the zombies it's going to be a challenge, but I'd rather survival be the challenge. Tight Controls: I was impressed at how well the light gun game played on the Wii. Targeting was spot on and responsive when I played it, making for a fun experience. Shaky Cam View: Rail shooters can be a bit boring at times, but Capcom fixed this issue by giving the entire game a handheld-shaky cam view. The idea, Noguchi told us, was to make it feel like you were out of control and reacting like real people would when confronted by the living dead. The idea works with the shake adding quite a bit of tension, and even a bit of much needed difficulty to the game. Amazing Graphics: I was surprised at how good the Wii game looks. Sure it's not high-def Playstation 3 or Xbox 360 graphics, but it's one of the better looking shooters I've seen on the console. Hot Swapping Weapons: Learning from Resident Evil 5, Darkside Chronicles allows you to assign weapons and items to the d-pad on your controller and hot swap in the heat of battle. It's a fantastic addition to the franchise. Coop: The cooperative play, handled on a single rather than a split-screen, was surprisingly enjoyable. There are even moments when one player has to save the other from surprise zombie attacks. 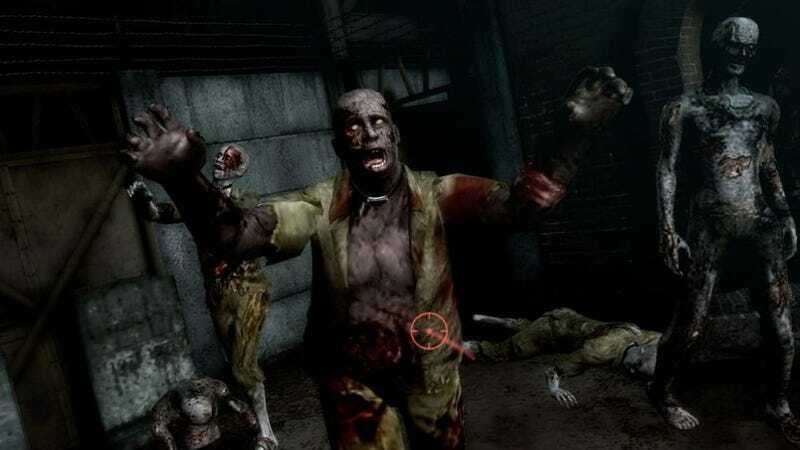 Resident Evil: The Darkside Chronicels feels more like an interactive horror simulation than it does a rail shooter. The addition of moody lighting, a shaky camera and tense voice acting makes you quickly forget that you can't control where you look and instead concentrate on what's going to pop up around the next corner.